Whether you have a vegetarian baby or not, tomatoes are one of the healthiest foods you can feed your little one. They are an abundant source of nutrients and vitamins, most notably vitamins A, C and K, but they also contain significant amounts of vitamin B6, folate and thiamine (B1). Tomatoes are a rich source of antioxidants, including lycopene, which is highly effective at fighting cancer causing free radicals. This benefit can be conferred even when eaten in heat-processed forms such as tomato ketchup! Which brings me to my next point... Few children will turn down tomato ketchup as a dipping sauce or condiment - something about the tanginess offsets savoury foods so well. But you may be surprised, or even dismayed, to know that most commercial varieties contain vast amounts of sugar. 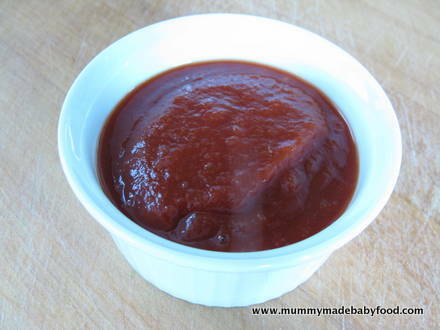 Luckily, this recipe is one of the easiest for tomato ketchup and still manages taste great without added refined sugar or even salt. Not only for the vegetarian baby (filed here for lack of a better place and because tomatoes are also considered vegetables ;-) ), this recipe can be used for the whole family. I like to cook a large batch of this at once and then freeze in small portions for future use. That way you can always be sure to have some tomato ketchup on hand when needed. The blend of spices and flavours in the recipe below are simply divine, but you could customise it by adding more or different spices to suit your or baby's taste buds. For you, or any older children, a pinch of chilli powder would give a nice kick to the sauce. You could also sweeten it with a couple of tablespoons of raw honey or maple syrup, for babies over 1. 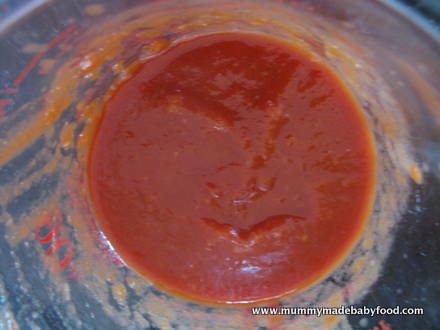 However you choose to customise your home made tomato ketchup, it will certainly become an instant household favourite! This recipe yields approximately 250ml of tomato ketchup. Put all the ingredients into a small saucepan, and mix together. Boil gently on medium to low heat for 5 minutes. Then turn off heat and allow to cool slightly. Remove the bay leaf and cloves. Pour the mixture into a blender, or use a handheld stick blender, to puree it into a smooth consistency. If using a stick blender, you may find it easier to first pour the mixture into a deeper and narrower container. 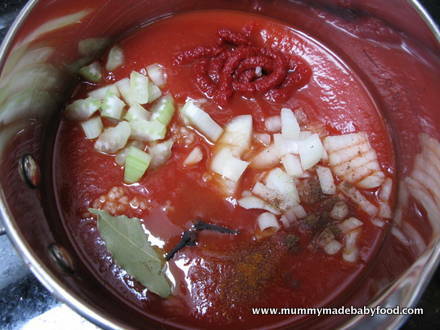 The sauce will thicken once it has cooled. Freeze small portions for future use, or cover and store in the fridge for use within a few days.